Ridership on the UP Express has tripled since Metrolinx cut fares, to more than 8,000 daily riders, according to Torontoist. The number of riders continues to grow, although at a slower rate. While other groups have pushed for similar goals in the past, TTCRiders is a city-wide organization, not based only in the west end. 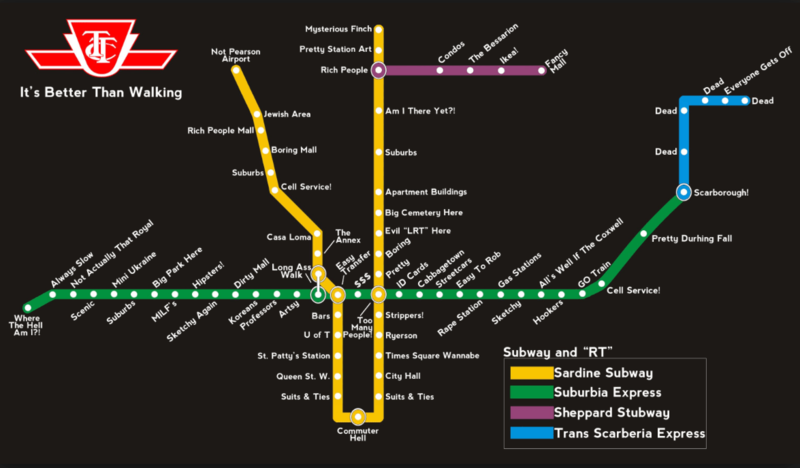 It is also backed by airport unions (whose members may take the train). The group says that Metrolinx will be setting the fare for the UP Express (likely to be between $20 and $30) at its December 11 meeting. The petition has received 323 signatures. The stops you won’t be getting. The Clean Train Coalition was in court yesterday fighting Metrolinx over its decision to order diesel trains. The Star has a long and balanced article describing the lawsuit. The CTC is suing, it says, because Metrolinx put politics ahead of good policy, and because the trains were ordered before electrification was fully considered. Provincial transportation agency Metrolinx had no business ordering new diesel trains for the Pearson-to-Union Station rail link before completing a feasibility study on electrifying the line, a lawyer for Toronto’s Clean Train Coalition argued before an Ontario Divisional Court panel on Monday. The CTC… wants the court to order Metrolinx to set aside its $53 million order for diesel multiple units (DMUs) [saying] Metrolinx was guided by political interests rather than good transportation planning in agreeing to an ARL completion in time for the 2015 PanAm Games. Mike Sullivan, our MP, took the opportunity of the suit to speak in the House. He was critical of the Ontario Liberals, and asked for the Feds to push electrification on the project. The McGuinty Liberals in Ontario are pushing Metrolinx to use diesel, despite the World Health Organization recently declaring diesel exhaust to be a Class One Carcinogen. They are pushing to make sure the project is ready for the 2015 Pan-Am Games. Ironically, the Olympic body responsible, ODEPA/PASO, has declared these games to be the first ever green and sustainable games. Diesel trains are neither green nor sustainable. There is considerable federal money in this project. I would urge the Federal Minister of Transportation to tell Ontario to do the right thing and make these trains electric now, as any world class city should. 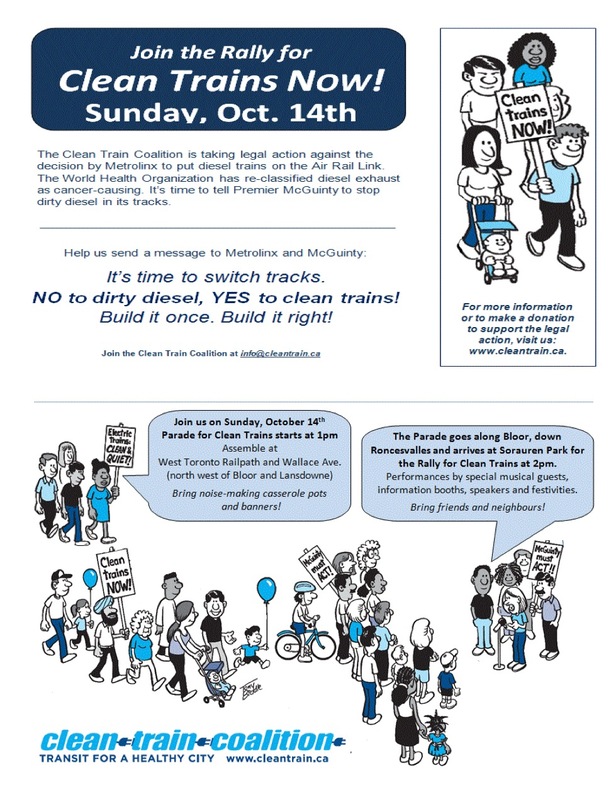 The Clean Train Coalition will be having a rally on Sunday, October 14 at the West Toronto Railpath starting at 2 pm.